Habib University’s Talent Outreach, Promotion and Support Program is designed for students who are enrolled in Pakistan’s Board of Intermediate Education (BIE), Federal Board (FB) and the Aga Khan University Examination Board (AKU EB) for their Intermediate Education. HU TOPS provides an opportunity to talented students of BIE, FB and AKU EB to apply for admission to Habib University and get admitted with full tuition and Laboratory fee waiver for their undergraduate degree based on their academic talent and passion to learn. Habib University believes in providing equal opportunities and nurturing talent and potential irrespective of educational, socio-economic and ethnic backgrounds. HU TOPS is an example of this commitment to Pakistan. The University will ensure students enrolled through HU TOPS shape thoughtful careers and life paths for themselves. They will be supported in growing as life-long learners, creative problem solvers and dynamic leaders, with a passion to serve the society. 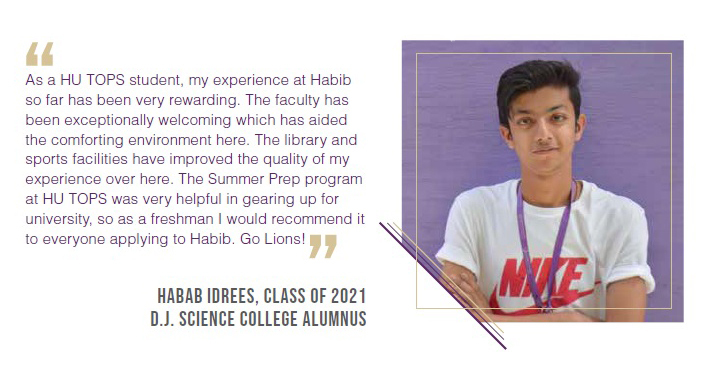 An exceptional opportunity to study at Habib University for a transformative learning experience. Have completed or will complete HSSC II by August, 2019. Science Group Students: 80% or above in SSC (Matric) and 75% or above in HSSC. Other Groups: 75% or above in SSC (Matric) and 70% or above in HSSC. Take the HU TOPS Core Skills Test. Click here to see the details of the test. Successful applicants from qualifying round will apply for admissions to Habib University through HU TOPS. They will not be charged any admission application fee. The HU TOPS applicants will be invited to participate in a Free of cost Summer Prep Program to prepare for the HU Admission Test. The Program will be organized in June 2019. Participation is not mandatory. The top 50 successful applicants will be offered admission in their Major of choice. Tuition, Laboratory and Semester Registration fee for their four-year study at Habib University will be fully funded through scholarships and grants. All HU TOPS Scholars will be required to maintain a CGPA of 3.0 to continue with their scholarships and grants. Full Tuition Fee to study a four-year undergraduate program at Habib University. The expense for books, stationery and other learning resources needed as per programmatic needs. If you have further questions or need assistance on some specific issue, please don’t hesitate to contact us. Our office hours are Monday-Friday, 9:00 a.m.to 5:00 p.m.